Dawn patrol, coffee duty. Muddy puddle paddle and we’ll meet on the gravel bar. Silt-swell, standing wave with 4.5 inches of rain in the forecast, but our backs are on the dirt and our eyes are on the star-choked skies. Canvas-walled clubhouse, beach front property, and the water’s rising. 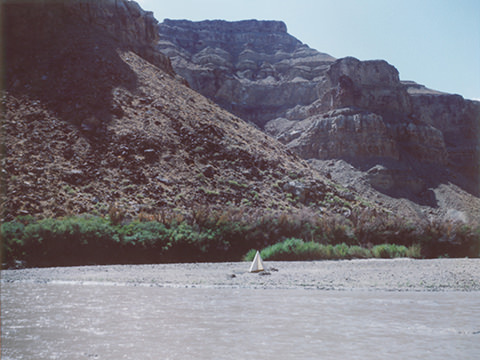 During the week of Cabin-Time: Green River, I attempted daily to surf a small, standing wave among the churning, latte-colored rapids of the Green River. 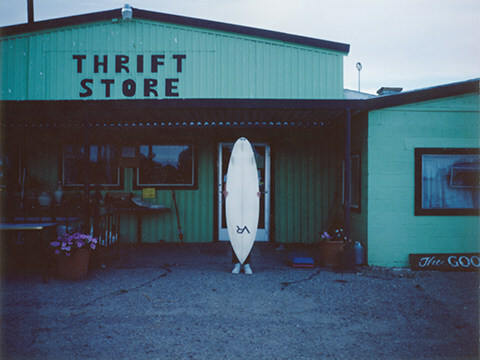 At the end of the week, I donated the surfboard to the Green River Thrift Store. Geoffrey Holstad is a native northwoods plein air graphic designer, illustrator, creative director, citizen meteorologist, and Shackleton-inspired optimist. "... I think the parameters of the place and what was available helped me think critically and creatively about projects and provided an interesting scope to work in."